Harry Stanhope and his brothers Ted and Herbert (descendants of J Montagu Spencer Stanhope of Horsforth) applied for a patent for a type of front-wheel drive in July 1914. The family was in the clock and jewellery trade with a shop at 119 Burley Road in Leeds that one of the first in the area with electric lighting powered by a gas engine generator. Herbert (senior) and his sons were interested in mechanical things, but it was Harry whose designs was the basis of the patents, although his father's name appears on some applications. Early experiments were carried out in a cellar that extended into the basement of the adjoining property and financed by a wealthy Leeds motor trader, Rowland Winn MIAF, who ran a number of garages and held agencies for Talbot, De Dion, Belsize, Cadillac and Ford. The prototypes had a belt-driven single front wheel with the drive being transmitted by sliding forks that allowed the wheel to steer. This setup sounds complicated but work very well and was perfected during the war years. After the war Stanhope Motors (Leeds) Ltd. was created to make cars at the Burley Road address. In 1920 the factory moved to the Greenside Works, Dixon Lane, Lower Wortley, Leeds. The original press announcement appeared in July 1919 and made it clear that it would be some time before cars were available to the public. In July 1920 the motoring press had their first chance to try the new car. Powered by a 8 hp air-cooled v-twin JAP engine and described in some reports as a sports type and was originally to priced at £90, but post war inflation increased this to £225. Average speeds of over 40 mph were achieved and cornering at speed had outstanding stability. A glass panel in the lower part of the dash allowed the driver to keep an eye on the belts and pulleys while on the move. The post war slump and the moulders strike of 1919/20 seems likely to have caused Rowland Winn to withdraw his backing during 1921. Walter Bramham (a wealthy pork butcher) had seen the hill climb successes of the cars at Harewood and Sutton Bank and agreed to take over the company and provide the finance for continued production. In March 1922 the company name changed to Bramham Motors (Leeds) Ltd. and announced that the cars would now be known as Bramhams. The factory was to remain at the Greenside Works. Two new models were announced, both using the 8 hp JAP engine. The belt-driven model was sold for £160, but the chain-drive model cost £30 more but had a better finish. A 5 cwt light delivery van was announced as well as a sports model. Some sports models were built and one had some success at hill climbs. Herbert Stanhope (Junior) continued experimenting and very few Stanhopes (or Bramhams) were alike. All this added to production costs and in 1923 a four-speed gearbox was introduced as well as a tandem body capable of accommodating "four small-girth people or two bulky persons". 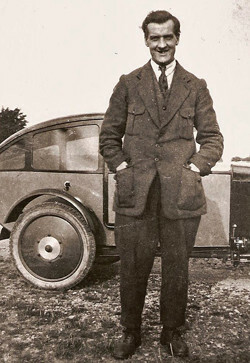 Although Brmham had purchased the patents he allowed Harry to continue producing technically advanced front-drive cars in the same factory. These specials were built to order and had four-cylinder water-cooled engines from Singer, Blackburne and Triumph. The Bramham was exhibited at the 1923 Motor Cycle Show at Olympia as both two and four seaters and as a delivery van. This was to be the last appearance of the Bramham as by 1924 Walter Brahmam shut down the works and ceased all motor manufacturing and converted the building to manufacture pork pies. Harry and his brothers seem to have taken over some of the equipment as the Stanhope reappeared in 1924 from the Burley Road address. There were three four wheel models, a two-seater at £200, a four-seater at £225 and a sports model priced at £225. The size of the premises meant that production must have been very limited, but they were still in business in October 1925. Harry Stanhope died during the 1925 influenza epidemic causing the final closure of production. A single example of a 1923 Bramham survives but if any other vehicles are known please contact the webmaster. The information on this page, and the photograph of Harry Stanhope, was kindly supplied by Peter Stanhope, a descendant of Harry Stanhope.